Had a Manners MCS-T5A ordered in Nov 2016, just got word from my smith that it arrived today. That's good news, I've had an EH1 on order since mid-October. That seems pretty quick. I oredered one in Jan. I'm hoping by June. That's pretty quick. Was it the Elite Carbon fiber model? No doubt! I'm about to order a McM Game Scout because it's only a 4 month wait. IF I could get a EH-3 in about the same time.... heck, I'll order the Manners! I was told ~ 30 weeks the other day by a local builder for Manners. It is not an elite carbon fiber model. I was told that it will take 7 to 10 months to get here so I was happy to hear it only took 3. I got my T6A carbon elite in 5 months. Unfortunately they didn't include action Screws or a magazine plus it looks like my trigger is interfering with the mini chassis. Put an order in for an EH1 on Jan 15. Will post when I get it. As a follow up to my above post, I shot Mr. Manners a PM and literally with an hour got a phone call. They have arranged to have me send back the stock (with my trigger) and they will inlet the stock for me and send me the missing parts. I have heard of the outstanding customer service from this company, and I want to echo everyone's sentiments by saying this company does not fall short on customer service and it is very clear that they are willing to go above and beyond to take care of their customers. Other companies should strive to maintain this level of service and after-purchase care! Is Tom doing the group buy this year? I've had one on order since November. At the time they told me 6 months. I checked with them last week and it sounded like it was ahead of schedule. In the meantime I've found two on their ready to ship stocks that met my needs. You might want to check it out. They just put a bunch more on that list. 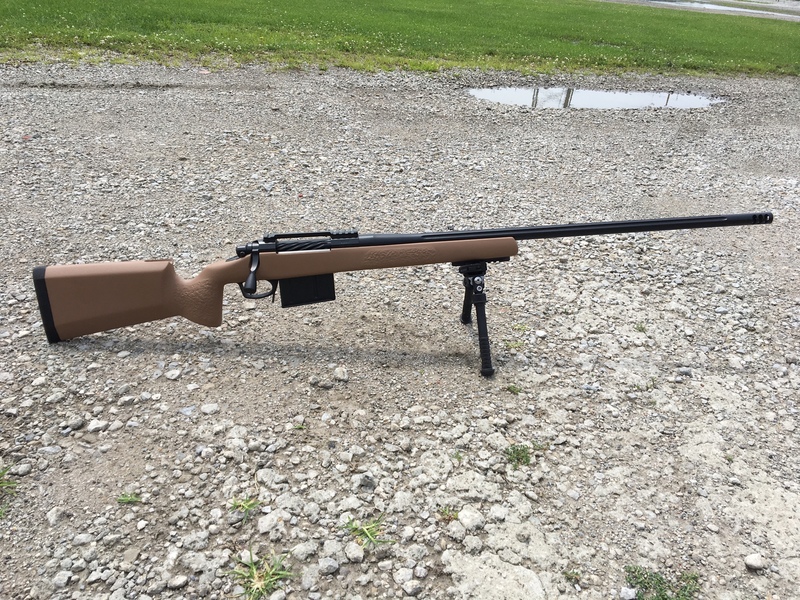 are the wait times long for a tikka t3? I have been told in the last week that 5-7 moths most likely from manners. I ordered my Manners T2A Elite Cabon on November 2nd. Sent an email to Manners about two weeks ago and they said 4-5months. I sold my old PRS rifle to make this build happen. Wish I had known in advance that leads time were this long. 4-5 more months from now or the order date? Thanks for the fast response. PM'd you already. I do believe some of the hold up is do to making a few slight changes to the inlet and some other add-ons. Still believe Manners is the best on the market. Bought my first one used from a guy at my local club. He never finished the build. It has held up outstandingly for the past 5 years. I'm not easy on my equipment either. It has allowed my to take a dozen deer in NY in that time frame at distances out to 600 yards! I just placed an order for my second build. It's a TF4 Elite. I'm super excited but I was never given a lead time. Any ideas on wait time for these? Any hold up on the folder or elite stocks? I called them Thursday about a Tikka T3 stock and was told 6 months. I'm posting from my phone and don't have my exact order, but the T2A I received in December took only 5-6 months. I'm having it pillar bedded this month. I sent in a T5 to have a mini chassis installed and the stock painted, and had it back in 3 weeks. Great service. I ordered a Tikka inlet T7. Approved order today. I was told 5-6 months is the current lead time. Will update when stock arrives. Manner's comes thru early. Just got an email, my stock is in finish should be 1-4 weeks before completed. My heart is pounding. Just waiting on Bartlein now for my barrel and I have to order a set of rings. Then off to Travis Ridell at R Bros. Stoked!! Just paid for my T2A with Tubb 4 way system will update when it arrives. Ordered an EH1 with mini-chassis in late December. Just got word that it is complete. 4.5 months is not bad. LRI is shipping a new barreled action tomorrow. May is going to be a good month this year! I placed my order for a MSC-T4A ELITE SWAMP on October 12th. I haven't heard anything as of yet, but I will post when I do. Just got off the phone giving my CC info to them, my stock should ship tomorrow. 4 months and a week. Ordered an EH-1A in swamp camo on 2-27-17 and it arrived 5-17-17. Changed color early on to one that had just made a batch of and it came out nice and quick. Thanks Manners. This is irrelevant to Manners lead times but has anyone ordered a stock in their earth brown finish? 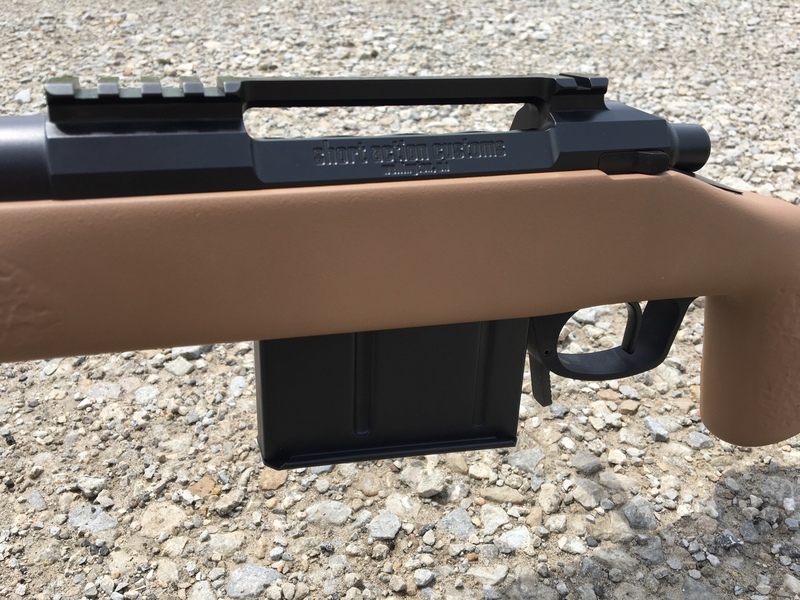 I have four T4A stocks in coyote tan and just curious what earth brown looks like. My last one was 4 months. Did not get a mini chassis. I have one at the shop right now, I think it looks excellent. Kind of a mix between the coyote and and chocolate color. I received my stock yesterday 6-22-17. THANKS TOM!! Anyone know if the Gen 2 mini-chassis has cutouts to fit the Timney 2-stage CE? Not a new stock order, but i was just told about 4 weeks turn around time to install gen 2 mini chassis' in my two T4A's. One is for a badger 2013 and they are fixing a couple issues that i made myself. Also, my e-mail was answered in less than a half hour from me sending my request and that was at ~8PM est. Truly a great company to work with! For some reason I couldn't PM you back cause the texting function wouldn't work on my phone. Anyways here's the dark earth finish on the EH1 that SAC just finished. Does anyone know if manners is doing the midnight molded in camo with blaze orange thrown in? You can choose three colors if you use the "stock builder." Not sure if blaze orange is an available color, but all the colors from their patterns are available. Will a Lawton 7000 action work with manners stocks cut for a 700 action .